As Kingdoms rose and fell throughout the Middle Ages, battle shields were a necessity, representing who you were fighting for, then hand-painted with the colors and symbols granted to your family – your coat-of-arms. 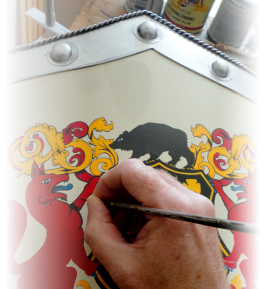 Forged from steel and curved to deflect swords, the Duke Shield honors the knights of these campaigns with the historical coat-of-arms granted to your family surname, painted by hand on a 25” h x 18” w medieval shield. 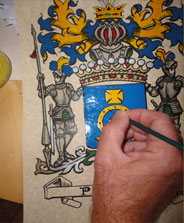 Then, the authentic coat-of-arms is hand-painted by a master artist with durable oil-based enamels for vibrant color and lasting finish. A metallic border seals the look, and a chain at the back makes for an easy wall display.